"In launching this investigation, the government has acknowledged the real risk of bias when relying on predictive policing programs powered by algorithms. So why are they already being rolled out by police forces across the country?" asked Hannah Couchman, policy officer at Liberty. "We should all be troubled by the silent expansion of the use of opaque algorithmic tools and the clear impact they have on our fundamental rights." A spokesman for the Department for Digital, Culture, Media and Sport, which launched the inquiry, told the BBC: "We know there is potential for bias but that is not the same as admitting that there are flaws in the system already." But the CDEI will work with the Cabinet Office's Race Disparity Unit to explore the potential for bias in algorithms designed for crime and justice. 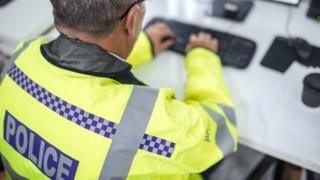 They fall into two types - predictive mapping of crime hotspots and risk assessments of individuals to try to work out who is more likely to commit an offence or become a victim of crime. The force previously told the BBC that it made "every effort to prevent bias" with data not including ethnicity, gender or demographics. Luka Crnkovic-Friis, chief executive of AI start-up Peltarion and co-founder of the Swedish AI Council, told the BBC: "Because AI is trained by people, it's inevitable that bias will filter through. "Automation tools are only ever as good as the data fed into them, so when using historical data where there is a strong human bias - such as race, re-offending rates and crime - there certainly is a risk that the results could produce bias and the government is right to take steps to account for this." "We need to make sure that the CDEI is as focused on where it [artificial intelligence] is being used in government today as well as the further challenges that tomorrow's usage may bring," he told the BBC.